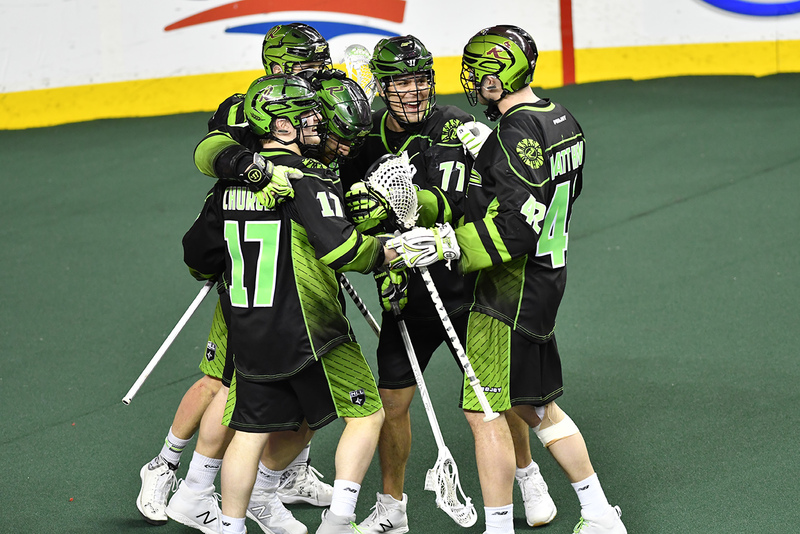 As the hottest team in the NLL, the 10-2 Saskatchewan Rush added another win to their column on Friday. The Rush managed to scored eight first-half points to come away with a 16-10 win over the Buffalo Bandits at Key Bank Center. The Rush have been no slouch when it comes to scoring in the NLL as they sit atop the league with 192 goals scored. This has been the common theme all season which is reflected in their impressive winning percentage and record. Friday night’s game reflected all of the positives the Rush have been glorified for as they opened the game with five first-quarter goals. Though the Bandits scored three along the way, a three-goal streak by the Rush led by a pair of goals from Robert Church and Mark Matthews seemed to be too much for the Bandits in the opening minutes. Though the Bandits went into the second quarter down by two, it didn’t take long for newly acquired Shawn Evans to have his presence felt as he scored his first goal as a Bandit just a minute and a half into the game. The second quarter was blurred by a sea of green and black as the Rush dominated from the whistle. Church scored two more goals. The Bandits had to settle for a lone goal from Dhane Smith and faced an 8-4 deficit at the half. Third quarter scoring was owned by the Rush yet again as they seemed to have two goals for every goal the Bandits could muster. Marty Dinsdale and Jeff Shattler introduced the scoring into the half as they scored one a piece. Moments later, Evans found his name on the score sheet again as he beat former teammate Evan Kirk twice in the frame for his first hat trick as a Bandit. Dinsdale and Ryan Keenan would rain on Evans’ parade as they scored back-to-back goals to give the Rush a 13-6 lead going into the fourth quarter. Though the Bandits seemed to find their mojo in the fourth quarter, as goals from Dhane Smith and Jordan Durston fired up the Buffalo bench, it wasn’t quite enough. The Rush capitalized on what seemed to be every offensive opportunity in this game and three fourth quarter goals would seal the deal for them as they win this one 16-10 the final. Mark Matthews and Robert Church were arguably the secret for success as they finished the game with nine (1G/9A) and eight (6G/2A) points, respectively. Matthews has been a complete powerhouse for the Rush this season as Friday night’s performance was yet another showcase as to how much of a threat he is. Matthews and Church weren’t the only standouts of the game as Kirk collected another win, steering away 42 saves in the process. The Rush’s next game will be against the improved Rochester Knighthawks who bested the Rush 16-11 the last time they faced off against one another. The Bandits look to bounce back from this one as they take on Evans’ former team, the New England Black Wolves.